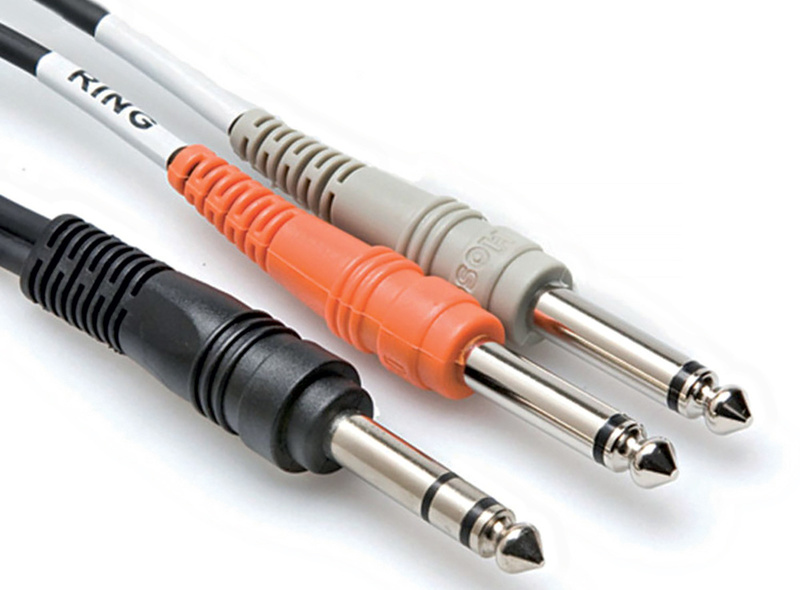 A simple 'Y-lead' (an insert send/return cable with a TRS connector on one end and dual TS connectors on the other) is all that's needed to connect a stereo headphone socket to two mono inputs of an audio interface or other recording device. 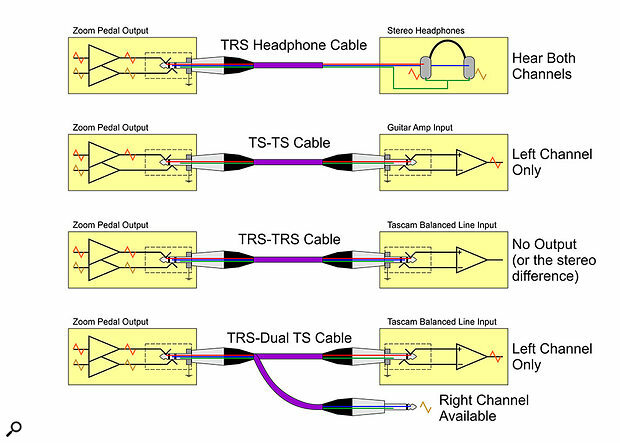 As the diagram shows, though, other cables that physically fit the same sockets can easily result in no signal.I'm getting a Zoom G2.1u pedal, which has an unbalanced stereo line/headphone output that can be used either for stereo headphones, or for connection to a conventional guitar amp. However, my Tascam DP-24SD has balanced TRS/XLR inputs. I think that an unbalanced stereo source will work fine into a balanced TRS input, but only the left channel will be heard (which would be no different to plugging it into a mono amp). But am I correct? Technical Editor Hugh Robjohns replies: I'm afraid not! An unbalanced stereo output socket (TRS) presents the left channel on the tip connection and the right channel on the ring connection, with a common return/ground connection on the sleeve. This is the same arrangement as stereo headphones, so you can listen to the effects in dual-mono/stereo just by plugging stereo headphones into that socket. Alternatively, if you connect the pedal to a guitar amp using a standard (mono) instrument lead (with TS plugs), the tip contact will pick up the left channel, while the sleeve will ground the ring contact and silence the right channel. I think this is what you were thinking of when you suggested only the left channel will be heard. 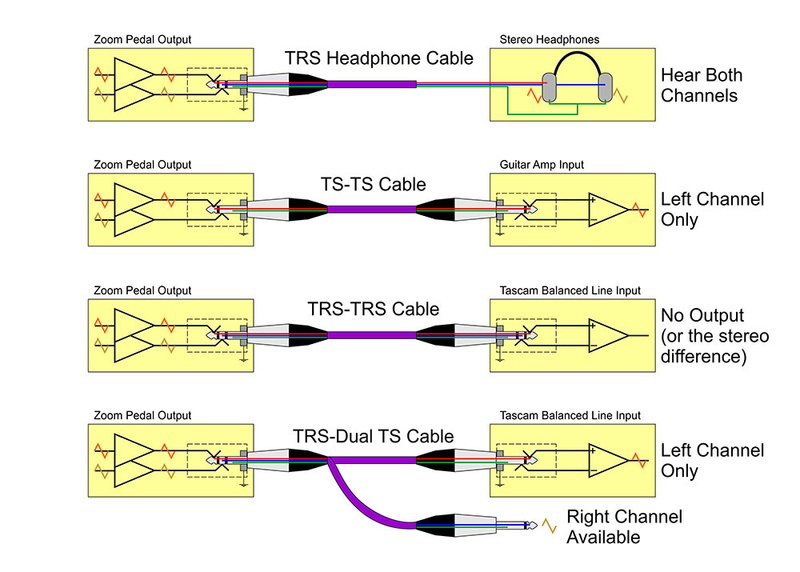 However, if you connect the pedal to a balanced line-level input, such as those on your recorder, using a standard balanced cable (with TRS plugs) you'll actually get very little signal at all. The reason is that a balanced (or 'differential') input looks for the difference between the voltage at the two (hot and cold) signal terminals. So if you are using a mono effect, the left and right outputs will be identical and the balanced input will detect no difference at all between the hot and cold terminals — and thus no net signal. Different cables that physically fit the same jack sockets can easily result in no signal. If you're using a stereo effect instead (such as a stereo chorus or reverb) there will now be a difference between the left and right channels, so the balanced input will detect some difference between the hot and cold inputs and thus some signal will be received... but you'll only hear the stereo difference element (the Sides signal from the Mid/Sides equivalent, actually). As a result, if the pedal is producing a blend of guitar with stereo reverb, you'll hear some reverb, but the centrally panned dry guitar will be missing completely! So, if you want to connect an unbalanced stereo source (like that from the Zoom pedal) to a balanced input, you'll need to use a Y-cable to split the left and right channels onto individual unbalanced plugs, and then plug those into two inputs of your recorder. In this way, the unbalanced (TS) plugs will send the signal into each balanced input's hot terminal, while simultaneously grounding the cold terminal, so that the differential input receives the wanted signal.